Composer Dorothy Chang’s music is clearly and rigorously crafted, she repeatedly finds inspiration from daily life, as well as folk instrument sounds from her cultural and genetic heritage. This gives her music a sense of connection to thoughts, experiences and emotions. Chicago based Tenor Josh Lovell has already been identified and trained in the leading opera professional young artist programs. His performance of the Rossini’s “Semiramide” aria will surely be something to remember. Gioachino Rossini’s “Semiramide,” is a dramatic aria (and role) only attempted by great tenors. 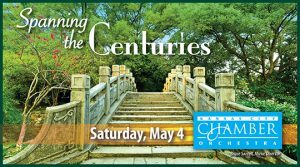 “Spanning the Centuries” begins at 8:00 p.m., May 4th, at St. Paul’s Episcopal Church, 11 East 40th Street, Kansas City, Missouri. The Pre-concert Talk with conductor Ward Holmquist about the music and composers will begin at 7:00 p.m. Individual tickets range from $20 to $30; senior and student discounts are available. Purchase tickets online at KCChamberOrchestra.org, Eventbrite or (816) 235-6222.